These Fat Shasta Lake Dinner Bows are full of Shad making them taste so good! 12/16/18 - Just Wow!! I've fished through a lot of weather over the years, but yesterday on Shasta Lake had to be one of the wettest. From the moment my client Kerry Krueger and I got on the water, until we got off it, it flat out poured rain. The kind of heavy big drop, ground soaking, reservoir filling rain, that just gets everything wet. Good thing the Trout are already wet and feeding like crazy on baby shad. We had a dozen hook ups despite the deluge and Kerry is taking home some fat Dinner Bows. Notice the fat bellies, they are full of shad. That rich diet makes these fish taste wonderful. 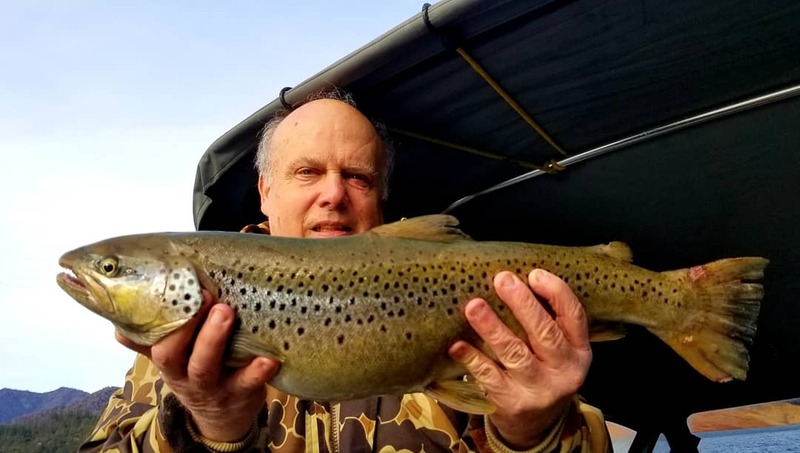 If you can handle fishing in crazy winter weather there are some great fishing adventures waiting for you. Christmas is almost here and if your still thinking and looking for that right gift, I have the best stocking stuffer Fishing Trip Gift Certificate ready to go.